Now that school is back in full swing I’m struggling to find healthy foods and snacks for my son. So it was nice to hear that Oscar Mayer Lunchables were making their Lunchables healthier. It’s difficult sometimes to find things that my somewhat picky eater will eat that I can feel good about it, and Lunchables, NOW, fit the bill. We’re both happy. Turkey + Cheddar Sub – turkey made with 100% turkey breast, Kraft 2% Cheddar and bread made with whole grain, these tasty subs come with Tree Top® Applesauce, Mini Nilla Wafers, spring water and Tropical Punch Kool-Aid Singles. Deep Dish Cheese Pizza – made with Kraft 2% Mozzarella and 2% Cheddar, deep dish crust made with whole grain, Tombstone Pizza Sauce, Tree Top® Applesauce, Mini Nilla Wafers, spring water and Tropical Punch Kool-Aid Singles. He loves cheese pizza and turkey subs so these were perfect choices. He loved them both and I’ve already bought more. And as an added bonus the already easy to go container now has many recyclable parts, making them a more environmentally friendly option. What’s not to love about that? Another thing I’m loving about Lunchables is the way they’re giving back. If you promise now to write a note to put in your child’s lunch, Lunchables will donate $1 to the Boys & Girls Clubs of America. You can select a particular state if you want the $1 to go to, as well. They will donate up to $100,000. I already leave notes for my son in his lunch, his backpack and snacks for extracurricular activities… so how easy is this? Go to Make A Promise – Make A Difference to make YOUR promise today. 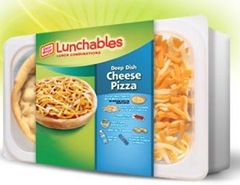 Kraft Lunchables is also asking kids to Create Your Big Idea where kids can have their big movie, song, or game idea turned into a reality. A great way to let your creative child show off their great ideas and who knows… they just could win big.